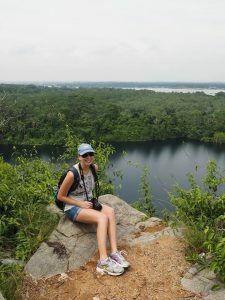 This past weekend, another student teacher and I explored Pulau Ubin, a Singaporean island just off the coast of the mainland. The island was advertised as rustic and relaxed, which we found it to be. It was enjoyable to take a break from the hustle and bustle of the city for the day. We spent the day biking, hiking, eating, and exploring. We took a small, rickety “bumboat” to the island, which is essentially a very small ferry. When we arrived we were greeted by fresh air and hoards of bicycles, the main mode of transportation on the island. 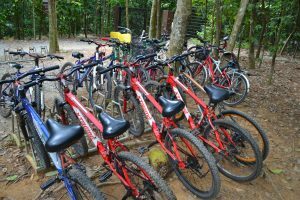 We rented a couple of them for the day and biked to Chek Jawa, a wetlands area on the island. We hiked across boardwalks and through rainforest, stopping to walk up flights of steps to a lookout area. We stopped for lunch at a seafood place in the “city” area of the island, which included bike shops, drink stands, and restaurants. As I’ve been in Singapore, I have began to love trying new food…and enjoyed my prawn (similar to shrimp) seafood rolls along with a whole coconut! The remainder of the day was spent biking around the island, looking at a Buddhist temple, and hiking up to the top of a small mountain, with an incredible view of the water and of Indonesia. 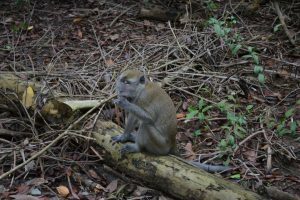 We steered clear of the many monkeys, who are known to steal anything they can get their hands on!